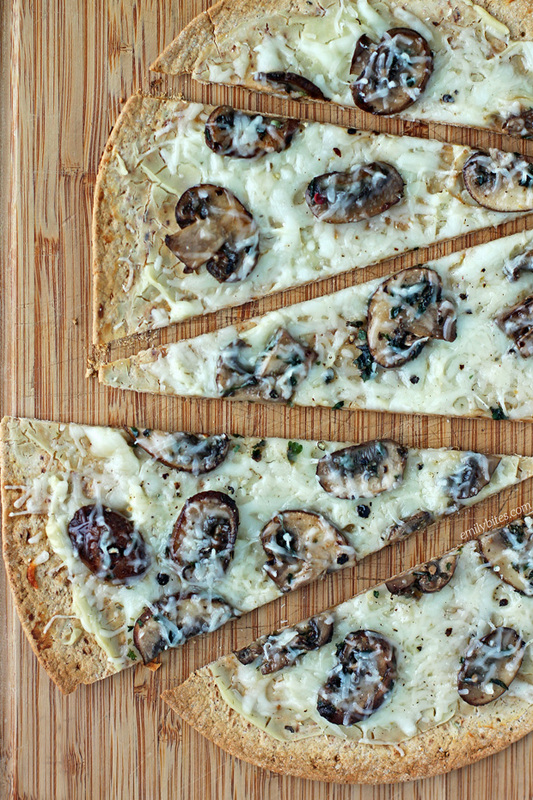 A thin, crispy flatbread crust with three types of flavorful cheeses and seasoned sautéed mushrooms with garlic and herbs may sound like something you’d see on a restaurant menu, but these Three Cheese Mushroom Flatbreads can be made at home in less than 15 minutes! These flatbreads would make an easy and delicious weeknight meal and can also be paired with salad or soup. I laid out the recipe below to make just one flatbread, but it would be very easy to make enough for the whole family all at once. As a bonus, each flatbread is just 265 calories or 8 Weight Watchers SmartPoints! Many of you know I’ve been working with Flatout to develop recipes with their products for quite a while now and I have to say making flatbread pizzas is one of my favorite go-to ways to use them. 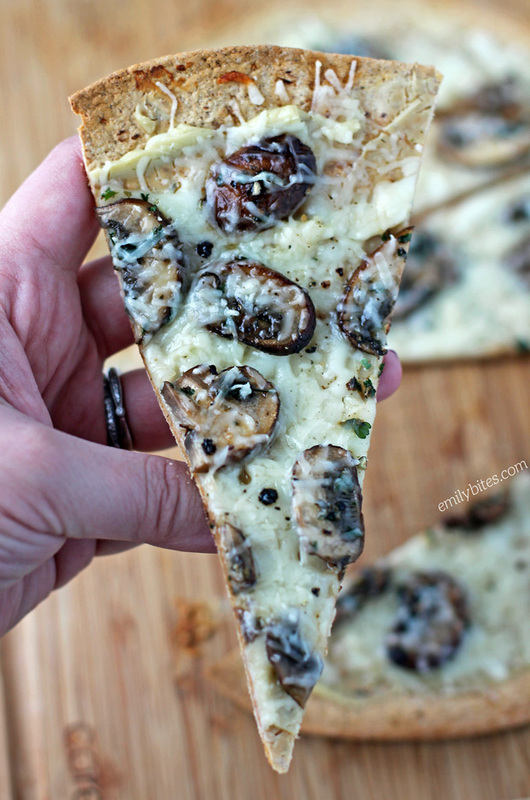 I adore a thin, crispy crust on my pizza and the topping possibilities are seriously endless. I always keep Flatouts on hand because it’s so simple to turn them into a fast and delicious meal on the fly with whatever we have on hand. Just grab a sauce (pizza sauce, BBQ sauce, pesto, spreadable cheese, etc), some cheese and then some veggies, proteins or other fun ingredients from your pantry or fridge and a few minutes later, dinner is made! Plus, Flatout flatbreads have healthy options to suit everyone (low cal, low carb, high fiber, high protein, etc) so you know you’ve got a good starting point. If you do want to put a little planning into your Flatout meals, check out some of my ideas like Spicy Southwest Chicken Wraps, Buffalo Chicken Pinwheel Wraps, Spinach Artichoke Flatbreads, Greek Snack Flats, Mexi Burgers with Guacamole, Chinese Chicken Wrap, Chicken Pesto Flatbreads and Bacon Cheeseburger Wraps. Lightly mist a small skillet with cooking spray and bring to medium heat. Add the mushrooms, parsley and marjoram and cook, stirring occasionally, for a few minutes until the mushrooms are browned and cooked. Add the garlic, stir together and cook for another 30 seconds to a minute until garlic is fragrant. Set aside. Place the flatbread directly onto the middle rack of the oven and bake for about 3 ½ minutes until they stand firm when lifted. Remove from the oven and spread with the cheese wedges, leaving a bit of space around the edge for the crust. Sprinkle the mozzarella over the top and follow with the mushrooms. Sprinkle the parmesan over the mushrooms and follow with a bit of black pepper. Return the flatbread to the middle rack of the oven and bake for another 4-5 minutes until the cheeses are melted and the edges are browned. Slice and serve immediately. Yum! I like that this is so ‘light’. We usually have flatbread on hand, so this is a great idea to try. We’ve made pizzas w/them in the past, and they were great. Made this last night–absolutely loved it! The combination of cheeses really makes it. We were speculating that it could be fun to add some other things, like some spinach, or tomatoes, or even some diced cooked chicken. Great recipe, and remarkably filling. This was delicious!!!! So easy to make too. Thank you! We made these for lunch today, and they got rave reviews, even from the 14-year-old who is just starting to like mushrooms. (I even doubled the mushrooms for the grownups.) They were quick and easy to make, and felt like a splurge. Definitely on our list to make again.